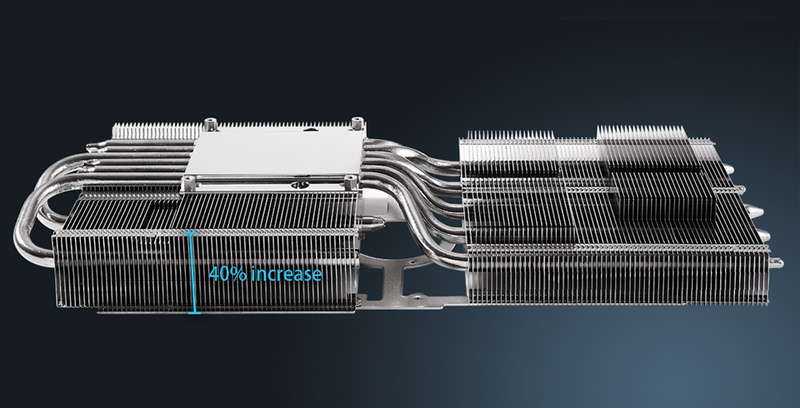 Patented wing-blade 0dB fans with FanConnect II maximizes cooling performance using three axial fans to deliver 105% more air pressure and dual 4-pin headers for referencing chassis fans to GPU temperatures. ROG Strix GeForce® GTX 1080 Ti gaming graphics cards are packed with exclusive ASUS technologies, including all-new MaxContact Technology that is 2X more contact with GPU for improved thermal transfer, and Patented Wing-Blade IP5X-Certified Fans for maximum airflow and longer fan lifespan. 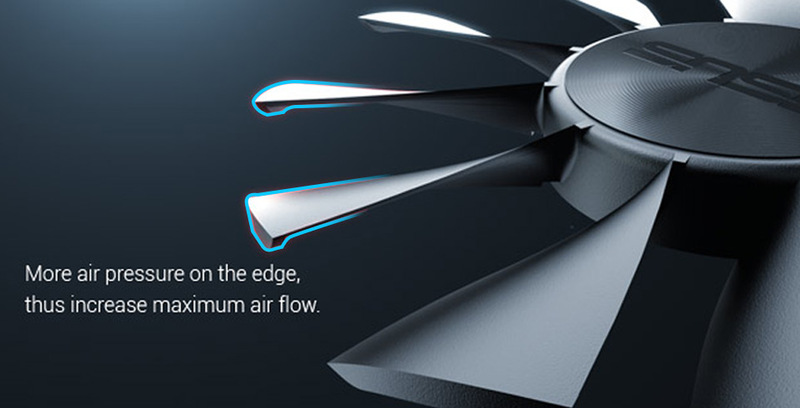 While ASUS FanConnect II features 4-pin, hybrid-controlled headers connected to system fans for optimal system cooling. ASUS Aura Sync RGB LED synchronization enables a gaming system personalization and VR-friendly HDMI ports let gamers easily enjoy immersive virtual reality experiences. ROG Strix GeForce® GTX 1080 Ti also has GPU Tweak II with XSplit Gamecaster that provides intuitive performance tweaking and instant gameplay streaming. GAME COOL AND PLAY SILENT40% More Heat Dissipation AreaUp to 30% Cooler and 3X Quieter Gaming PerformanceNew ROG Strix graphics are constructed with a 2.5-slot width, providing 40% more heat sink surface area for heat dissipation compared to previous 2-slot designs for dramatically cooler and quieter performance. *Images for reference only. 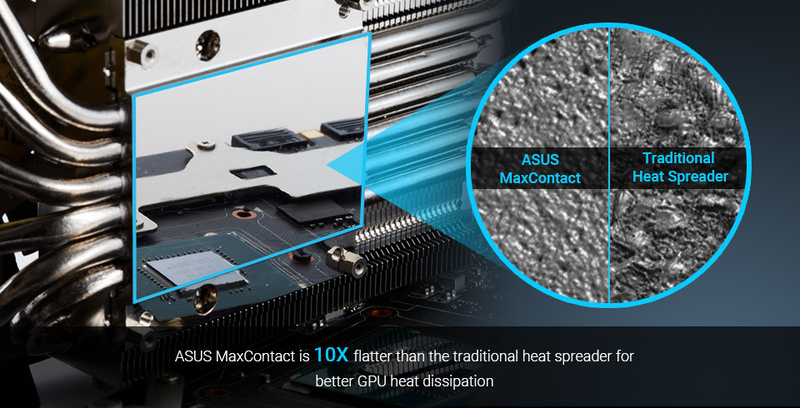 MaxContact Technology2X More Contact with GPU for Improved Thermal TransferMaxContact is an industry-first GPU cooling technology, featuring an enhanced copper heat spreader that directly contacts the GPU. MaxContact utilizes precision machining to provide a surface that makes up to 2X more contact with the GPU than traditional heat spreaders, resulting in improved thermal transfer. Patented Wing-Blade DesignMax Air Flow with 105% More Air PressurePatented wing-blade fans delivers maximum air flow and 105% greater static pressure over the heat sink, while operating at an up to 3X quieter volume than reference cards. Note． To have the best cooling performance, ASUS STRIX-GTX1080TI extends the fansink to 2.5 slots. Please double check you Chassis and Motherboard dimension prior to purchase to make sure it fits in your system! Seagate 1TB FireCuda ST1000LX015 Solid State Hybrid Drive 2.5"